Ties together the chassis braces for added strength and rigidity. Reduced sliding friction along smooth, grooved surfaces. Recessed screw holes eliminate damage to the screw-heads. A unique, matched groove appearance from the front of the truck to the rear. Dirt and debris protection all along the driveline. Extended area protects the disc brake from damage. Outstanding wear resistance from our bulletproof nylons. Smooth radii deflect the most devastating of impacts. Complete with all necessary mounting screws (heat-treated, flathead hex screws) and instructions. Pricing at a fraction of the cost of aluminum skid plates. 100% guaranteed against breakage. Available in black, blue, or purple! Competitive performance at intelligent prices. Nothing compares to the value and strength of RPM performance skid / wear plates. Version Identification: Not sure if these are the correct skid plates for your truck? There’s an easy way to tell. 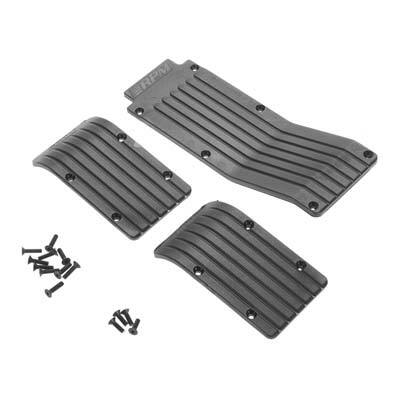 If your chassis braces (Traxxas #4923) do not have the word “MAXX” molded into it, these are the correct version skid plates for you. If “MAXX” is present, you need RPM #80772 or #80775. Important Note: RPM skid / wear plates require the use of stock plastic skid plates, bulkheads and (for center skid plates) chassis braces. RPM skid plates will work with most aftermarket aluminum front & rear skid plates but RPM guarantees the fit only when used with stock parts.